The Test Tubes are filled with Hot Chocolate, Chocolate Chips and Mini Marshmallow. The sentiment and cookie images are both from the Multi Step Cup of Warm Comfort. 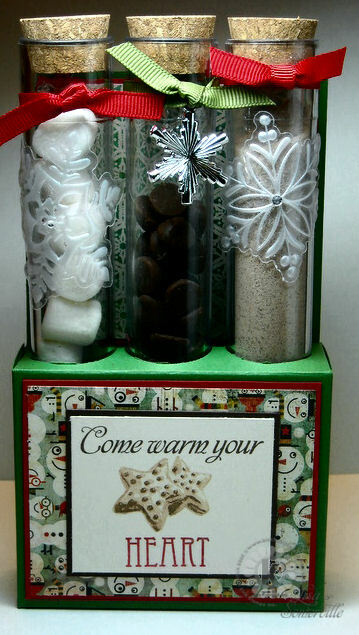 I added some Snowflake Decals, Ribbon, and a Snowflake Charm to decorate the Test Tubes. Beautiful! Love the image of the cookies and the adorable snowman soup! Perfect charm accent too! Oh Lisa! This is just waaaay too cute! What an adorable idea...a perfect gift for teachers and friend this holiday season! Hugs!! Absolutely awesome project!!! Hmm, I'm thinking this would be great Christmas treats! Thanks for the great inspiration!!!! What a fun and unique way to present hot chocolate!! Absolutely delightful, Lisa!! How sweet it is! Now who wouldn't appreciate such a beautiful gift, just luvin' it! Lisa, this is such a fun way to give a gift! Not to mention so appropriate this time of year! Love the cookies!! Makes me rethink College Chemistry. I think I could combine these with good results. Those cookies on the cover look so yummy! Thanks for sharing all of your great ideas with us! Very cute, love the idea of all of the different test tubes with yummy goodies. I love this tube gift set Lisa!! Fantastic use of the set! Thank you for the inspiration! What a clever & yummy gift! Very unique! I love your test tube projects. What a perfect project for this set of stamps. Oooh Lisa...what a great treat! It's like a hug in a test tube. *giggle I love the DP and the cookies look good enough to eat. Fabulous!